1:12 scale Floral Wallpaper for your miniature scene. 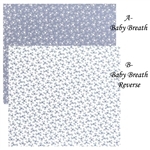 Baby Breath comes in Blue with White flowers or the reverse White background with Blue flowers. 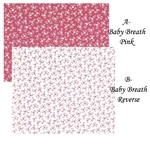 Baby Breath comes in Red background with White flowers or the reverse White background with Red flowers. Roosevelt Rose comes in either Blue, Rose, or Gold. Large Floral design. MiniGraphics paper. Chystina comes in blue or pink stripes. Large Floral design. MiniGraphics paper. Rio Dante large Floral design that coordinates well with Reflections, Ogee Lace,& Raffina . MiniGraphics paper. Reflections small floral with stripe that coordinates well with Rio Dante, Ogee Lace,& Raffina . MiniGraphics paper. 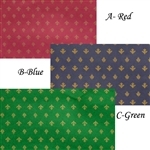 Ogee Lace small Floral design that coordinates well with Reflections, Rio Dante,& Raffina . MiniGraphics paper. Raffina small Floral design with border that coordinates well with Reflections, Rio Dante,& Ogee Lace . MiniGraphics paper. Du Barry Large formal floral print. Flowers in Vase . MiniGraphics paper. 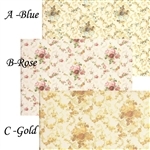 Perriwig small floral print could be used for 1" or 1/2" scale . MiniGraphics paper. Fleur D'Amour is a small floral print with diamond shape ribbon design. MiniGraphics paper. 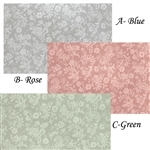 Mini-Roosevelt Rose is a floral print with flowers 1/2" compared to the standard 1" of the Roosevelt Rose . MiniGraphics paper. Shrewsbury floral stripe. Stripes are approx. 1/2" wide . MiniGraphics paper. Petite Fleur blue tiny flowers 1" apart. . MiniGraphics paper. Sheet measures 18" x 11"
Wild Strawberry a small print of leaves and strawberries . MiniGraphics paper. Sheet measures 18" x 11"
Society Gardens features sets of people 3/4" high with floral print. . MiniGraphics paper. 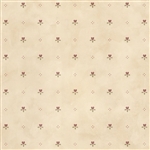 Sheet measures 18" x 11"
Rose Floral on beige background. A very nice heavy paper by What's Next. Measures 20" x 11"
Moire with pink stripe floral leaf stripe. A very nice heavy paper by What's Next. Measures 20" x 11"
Posies on a sand colored background A very nice heavy doll house paper by What's Next. Measures 20" x 11"
Pink Bouquet stripe. A very nice heavy doll house paper by What's Next. Measures 20" x 11"
Iris Yellow flowers with touches of blue. MiniGraphics paper. Sheet measures 18" x 11"